So, this is actually the part 2 of my problems concerning DigitalOcean WordPress 1-click-app and JetPack (about the first issue you can read here). If you read my first post you found out what I had to do in order to activate the Jetpack. All seemed fine and I could see the stats from WordPress installed on DigitalOcean droplet on my WordPress.com account and even some of the active things were working (like Photon or Contact Form). 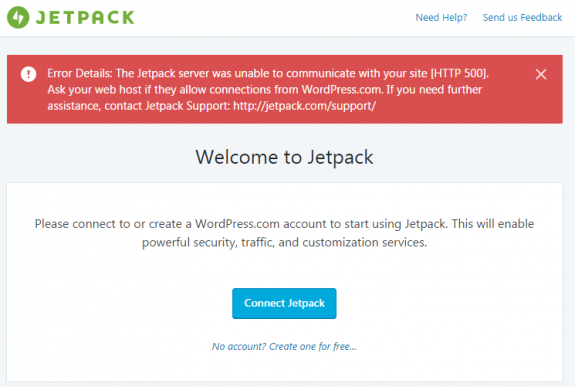 I was also unable to disconnect the Jetpack using the WordPress.com account and this was only possible if I would disable Jetpack at plugins and re-enable it again. Then I would have to re-connect it with my WordPress account and it’s a loop but the results were the same. It didn’t work! I have contacted Jetpack support but their help was similar to Microsoft support (restart the computer and try again), or in Jetpack case: disable all plugins and try reconnecting again. Since Jetpack support was unable to help me after we have exchanged couple of emails I have decided to dig deeper into this on my own. DigitalOcean community also wasn’t helpful since I found just one comment about someone having the same problem as I do but there were no reply or solution. and the result is 404 – the standard 404 page! Since there files on that path and WordPress installation doesn’t have wp-json folder at all I figured out that this is mod_rewrite path so I knew in what direction to focus my exploration. I’d like to mention here that this also happened on brand new, zero days blogs, no plugins installed, default theme: basically on out of the box WordPress installations. Also permalinks worked so mod_rewrite was working normally (or it appeared to be working normally), and that made the situation even more confusing. I have tired this on my other 5 or 6 sites hosted on DigitalOcean and it worked on all of them! I hope that some one from Jetpack or some geeks from DigitalOcean will see this post. I’d love to hear more about this issue. How is possible that mod_rewrite is working without being enabled on Apache or if it’s enabled why it doesn’t work for Jetpack plugin? I’m puzzled and I’d like some explanation. Now Jetpack is works normally on my DigitalOcean droplets, but on some occasions while setting up the Jetpack options I saw this message: Warning! Multibyte support missing! This means that multi-byte support php module was not installed. To get it installed simply install package php-mbstring using apt-get (or yum in case you’re using CentOS/RHEL Linux), restart Apache and you’re good to go! PHP multibyte should now be installed and these messages should no longer appear. If you click on the image and hit the Align Center icon inside the editor, it will give to that image a class named “aligncenter” (or left “alignleft” and right to be “alignright” in case you align it left or right) and it will look good in the editor. In some cases once you save the changes and go to check how the image looks on the site you can notice that it’s not properly aligned and instead of being centered your image is right aligned. This issue occurs on some themes while it works fine on the other (it works nice on the default WordPress theme) and the reason for that is that the theme doesn’t define these aligncenter (or alignleft and alignright) classes in CSS. These are introduced with WordPress 2.5 so some older themes are usually lack this and thus don’t work as expected. You can add the code anywhere in the file, but the end of the file is probably your safe bet. Once you save the changes you can reload the site and your images should now be aligned same way as in your editor. But the problem is not with the communication between WordPress.com and your DigitalOcean droplet. The problem is with the fact that following php modules were not installed: php7.0-xml and php7.0-xmlrpc. No we can argue why these were not installed by default: it might be due the fact that this way WordPress XML-RPC will not function and this would automatically reduce the amounts of spam on your blog (more likely) or that that the system would perform (slightly) better without these two modules (less likely) but in order for JetPack to work we need to install these two modules and to restart the apache. After you have done this logout out of your WordPress, then login back again and try once again to connect your Jetpack plugin. I hope it will work out for you since it just did it for me on more than 10 different droplets! How to solve wp-cron.php high CPU usage? It is known that wp-cron.php file can cause high CPU usage on high traffic WordPress sites. This can also occur on sites hosted on shared or VPS hosting when they receive more traffic than usual at short period of time (traffic spikes). Typically, every page load calls wp-cron.php to be executed and to run any tasks that are scheduled to be executed (like posting scheduled posts, plugin or theme updates, clearing caches on various caching plugins, sending email notifications etc). This basically asks WordPress: Is it time do do anything now? And then WordPress checks for pending tasks and if there’s nothing to do typically answers with: sorry, but there’s nothing to to at this moment… Try a bit later… and this probably happens in 99% cases. So this wp-cron.php literally nags WordPress all the time with those requests. On low traffic sites, this is perfectly fine but on high traffic sites (or sites with traffic spikes) this can cause higher resource usage, make problems with your hosting (vps/server) and decrease your site performance. Best way to prevent this wp-cron.php activity is to stop it from running the default way (on every site visit) and then just run it using cron when according your needs. That’s it! This will lower the CPU/resource usage instantly. But it’s not recommended to never execute wp-cron.php since your WordPress plugins and themes won’t be updated and your scheduled posts won’t be posted etc. There’s no general rule as for the frequency of this cronjob since every site and setup is different. Everything from once per day to every minute is fine but it really depends on your system. If you have tasks that run every 10 or 15 minutes you should probably setup cron to run every 5 minutes. It’s still quite frequent but it won’t happen that you get several cron runs in couple of seconds. While monitoring my system I have notices increased number of requests to xmlrpc.php. Every single of those requests took 200MB to 205MB of ram and resulted in system instability and in few occasions it caused my 8GB Digital Ocean Droplet to go out of memory and eventually crashed leaving all my sites not working for some 10hours or so. Recently I’ve read that many hackers now use xmlrpc.php instead of wp-login.php to execute their brute force attacks. And the problem is – since WordPress 3.5 you can’t disable the use of xmlrpc, at least not from the WordPress control panel. This is really not recommended. Also after WordPress (auto)update the deleted file will be replaced so it’s not really smart to do this, but I just wanted to write this just in case someone doesn’t try to do this. There are several plugins that can do this. I found these two to be the most used ones: Disable XML-RPC and XML-RPC Pinkback. Both plugins are really basic (only couple lines of code) but they should be able to help you out and protect your blog against those attacks. You can simply add this one line of code to your .htaccess file and block the access to the xmlrpc.php file entirely. User accessing the xmlrpc.php will get the 403 Forbidden error. Or even better adding this code (that also blocks wp-trackback.php and also prevent’s trackback hacking attempts). If you don’t use XML-RPC than you can safely disable it using any of the methods above (except the first one, of-course) and protect your blog against xmlrpc hacks.